Sometimes you feel like a nut, sometimes you don’t. If you don’t, today’s not your day. October 22 is National Nut Day! National Nut Day has been around for a long time in the U.S. A few years ago, it spread across the pond when Liberation Foods Company, a U.K.-based organization run by and devoted to supporting small farmers and nut gatherers in some of the world’s poorest countries, “imported” the holiday to England as a way to raise awareness for nuts while promoting a healthy lifestyle. The British take it very seriously, with an official website and a nationwide public awareness campaign. Talk about a noble cause. Here in good ol’ America, few people probably realize today is devoted to going nuts. But they should: nuts are healthy and nutritious, and are an excellent source of protein, fiber, vitamins, minerals, and antioxidants. It is believed that a handful a day can help prevent heart disease. There are many varieties of nuts, some meeting the true botanical definition (acorns, chestnuts, hazelnuts, palm nuts) and others considered culinary nuts (almonds, cashews, pistachios, walnuts, pine nuts, macadamia nuts, and peanuts). What’s the difference? Let’s ask Wikipedia! A nut in botany is a simple dry fruit with one seed (rarely two) in which the ovary wall becomes very hard (stony or woody) at maturity, and where the seed remains attached or fused with the ovary wall. A nut in cuisine is a much less restrictive category than a nut in botany, as the term is applied to many seeds that are not botanically true nuts. Any large, oily kernels found within a shell and used in food are commonly called nuts. Clear? Good! We had a tough time deciding how to celebrate. We’ve already paid homage to many different types of nuts this year, including peanuts, pistachios, pecans, almonds, pralines, hazelnuts, and macadamia nuts. They’re all good! We finally decided the best way to honor nuts, plural, was to sample from a can of mixed nuts. It’s recommended you eat a handful a day, and that’s precisely what we did. 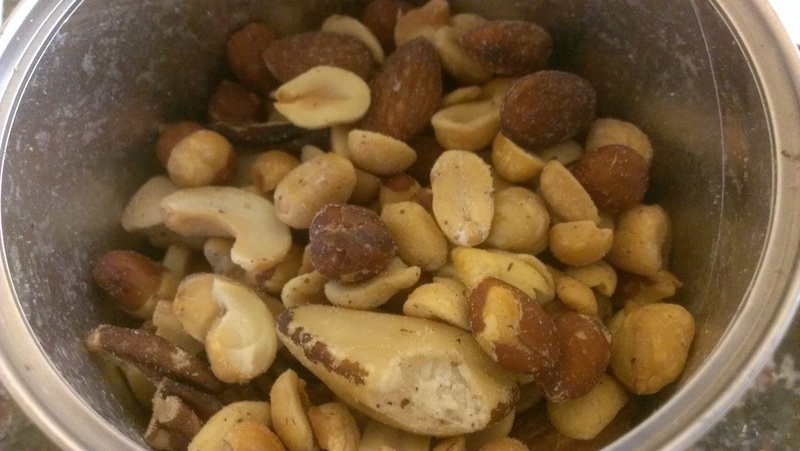 The can included peanuts, almonds, cashews, Brazil nuts, filberts, and pecans. All good stuff! I always feel like a nut! So cheers to national nut day! Hooray! As long as they aren’t baked in anything! Really? What about a nice, chewy, warm-from-the-oven chocolate chip cookie with chunks of walnut baked in? No?